Hey everyone and happy Friday! I'm in an excellent mood today. I was able to get a good night sleep so I put some thoughts into my outfit and makeup. When you look good, you feel good! You also become more creative with blog postings. I started BeautySpot about a year and half ago and noticed today that I'm at 291 followers! Initially, I never thought anyone would like to read my rambling. I remember how excited I was when I got my first comment ever (from Shayla of ReveNoir incidentally). I thought it's about time I share some blogging pointers for those new to blogging or those of you who just like to know how I got to where I am (which is really not that far, lol!). The first tip is that you have to be passionate about the topics you write about. BeautySpot is a makeup blog. I've always loved makeup, from buying to applying to finding what works best for me to discussing cosmetic topics with my readers. When I wake up in the morning, I get happy right away thinking about my makeup. I think about blog posts all the time; when I'm cooking, in the shower, during lunch break....If you're not passionate about your own blog, no one else will be. My blog is mainly to share my FOTD's with you guys as applying makeup is my favourite part of the blogging journey. However, I like to mixe it up by adding reviews, favourites, polls, discussion topics, nail of the day or random thoughts. I find the blogs I enjoy the most are the ones that have variety yet remain on their main topic, I try to do the same. I try to reply to comments on my blog as fast as I can. I don't leave any comments or question unanswered for more than a day (I try to reply much faster than that). I also love to do topics like polls or cosmetic discussion to know what my readers like or get their opinion on everything beauty. It helps me learn more about my readers which I always enjoy. One of the best ways for your blog to get more exposure is to discover other blogs with similar contents and interact with your felow bloggers. We all have busy lives, but this is one of the best ways to improve your blogging skills. I personally have a very demanding day job, a husband (lol!) and a relatively busy social life but I allocate 30 min to an hour a day to catch up with blogs on my blog rolls, comment on fave posts and discover new blogs. You never know how much there's to learn out there till your expand your horizons. Being a member of online communities and forums will also help you meet like-minded bloggers which will result in a better blog. You'll learn more about topic trends and what ppl like to read. I'm a regular poster on Specktra and many of my followers found me through there. I also post on Makeup Alley, Makeup Talk and Love, Life Lipstick. Contests and giveaways are sure ways to give more exposures to your blog. I've had two contests so far (one sponsored and one supported by me) and each of them have helped me tremendousely with more followers. I don't like to do giveaways just to get more followers, it's also a way to rewared my readers for their time and interest in my blog. If you go to Google right now and type "Chanel Rouge Coco Swatch", what do you see? My blog is the second one on the list right after Temptalia's. This shows how important it is to tag your posts appropriatley and use key search words. This is especially important if you use blogger which is a Google feature. Sorry for lack of creative looks and posts guys. Like I mentioned in my blog post, I'm having the worst time at work this week and simply cannot think of my makeup too much in the mornings. I'm hoping all that will change by this weekend. Hey everyone and happy Thursday! I for one am very excited that this blasted week is over. It was not a very happy one for me unfortunately, but there's always the weekend to recover from all the stress. For today's poll, it's going to be short and sweet. I've been toying with the idea of changing my blog template as I'm getting a lil bored with it. What do you guys think? Should I keep this one or get a totally different one? Also, do you feel like the layout feels a lil crowded? Please let me know if you have any feedback. for some reason, this blog post is giving me a hard time in formatting. No idea what to do at this point and I'm quite tired. Just wanted to share two looks, one from yesterday and another from today, hope you guys like them. Look #1 - Olive Greens, not my fave, I think the shades look a little too muddy on me. Look #2 - Corals, Loved this simple look today, and love love Nars Scorching duo and Gilda blush! Hey everyone and happy Monday! We're having another beautiful sunny day here and despite usual stresses at my site visit today, I'm in an excellent mood. I did this light aqua eyes and paired it with my beloved Chanel Rouge Allure Lacque in Phoenix. Can I say how much I love this lipstick? I'm gonna do a full review later this week but I thought i declare my love for it today, lol! Hope everyone survived Monday. Here's my look, let me know what you think. We're having amazing sunny weather in Ottawa this weekend so naturally I've been outside most of yesterday and also today. We met up with some close friends of our for dinner and then drink last night and I went for my tried and true smokey purple eyes. This time I made them shimmery as well and paired it with matte cool lips (Snob - one of my fave lipsticks ever). Glam Rock by Orly was part of my nail polish haul in March. This is a bronzey gold shade in matte finish. Despite my love of matte polishes I felt that this shade looks better with a shiny coat on so I did just that. I'm very impressed with Orly's fomula and application everytime I use one of their polishes and Glam Rock is no exception. I actually only needed one coat to achieve opaque look. Here's a swatch for you guys. Anyone tried this shade? How do you like it? From Nars I bought Schiap lipstick and Gilda blush. Schiap is a super bright cool toned pink lipstick; it's pretty much neon on. I'm a sucker for this kinda shade so I fulfilled my long time lemming and got this. I also purchased Gilda blush as I've been wanting a nice matte coral blush and this was it. I liked it better than Gina which was more on the orange side on me. They were doing a free gift with purchase of two items so I received a set of three mini Nars lip glosses in Risky Business, Moon Fleet and Stolen Kiss. I've never tried Nars lipglosses so this is a great opportunity to do so. I checked out Pret-a-Papier collection at MAC but nothing stood out to me. I was interested in the coral blush but it just paled in comparison to Gilda. I also liked to coral paint pot but figured I hardly ever wear coral on my eyes so I passed. Instead I bought Mouth Off (not pictured) which is a nice coral lip pencil from Too Fabulous Collection. I already have and love Naked, In Synch and Trimmed in pink from that collection and this one is a welcome addition. These lip liners have super soft texture and are pretty long lasting on me. I really wish MAC would make them permanent. Finally, I went to Chanel counter to pick up some lipsticks. I have been head over heels in love with Chanel ever since my Rouge Coco experience so I wanted to check out more of them. I ended up purchasing Rouge Coco in Orchidee and Phoenix Rouge Allure Lacque. Orchidee is a soft pinkish red on me and it's a subtle and work appropriate shade. Most of my stash consists of louder colours so I thought this would be a nice change for me. Phoenix is a bright strawberry pink that just screams summer to me. I don't have a pink quite like this and I love how pigmented these rouge allure lacques are. I was slightly annoyed that they didn't have their summer collection out but this haul will suffice for now. Here's a swatch of the lipsticks and the lip liner. I will be doing more detailed review of the products as I use them. Have you bought anything exciting lately? Do you own any of the listed products? Please share all in comments. Thursday Poll - what do you look for in a mascara? Happy Thursday everyone! I actually cannot believe it's only Thursday. I guess it's because it's been slow around here for me. Which is ok coz next week will be super hectic. For today's poll I thought of asking your opinion about purchasing your favourite mascara. What are some of the factors that you consider? I have been blessed with naturally long lashes. However, they're not quite black, more like a dark brown. So when I buy a mascara I want it to be super black coz I feel like the darker shade brings out my eyes. I also always look for volume. My current everyday fave is Cover Girl Lashblast Volume coz the price is right and it delivers when it comes to volumizing and it's also very black. My going out or night time mascara is Lancome Hypnose which has been my HG for 3 years now. This mascara really makes my lashes look lush, lol! I always get asked what fake lashes I'm wearing when sporting this mascara (for reference I've never even tried fake lashes). What factors do you look for when buying a mascara? Volume? Length? Colour (black/brown)? Please share in comments. Also let me know what your fave brand of mascara is. I'm in a foul mood today as I had one of those annoying sleepless nights. I was relatively awake first thing in the morning so I still did my makeup. But then things went downhill after lunch; I could hardly keep my eyes open. To make it worth I had to sit in a training session for 4 hours right after lunch. Needless to say, I was excited about going home and just sitting on the couch. I liked the makeup I did today though, the eye combo is nothing fancy but I do love the lips. I used to just put on lipstick and call it a day but lately I've been mixing and matching to come up with more interesting shades. Let me know what you think of this. 1) How many times do you wash your face daily? twice, in the morning and right before bed. 3) What is your current facial wash? I use a gentle wash by Clinique at the moment. 4) Do you exfoliate? I exfoliate my face 3 times a week with St Ives Apricot and my body twice a week with Lush Ocean Salt. I also use Nars Mud Mask on my face twice a week. 9) Do you or did you have acne prone skin?I did as a teenager, my skin has calmed down since but I do have some minor scars. 13) Do you know your undertone colour? I've been told neutral, I think it's pretty accurate. 16) What brand of mascara do you use? I use Cover Girl Lashblast for everyday and Lancome Hypnose for night out or special occasions. 17) Sephora or Mac? I used to be a big MAC fiend (still have a soft spot for them) but nowadays I would pick Sephora. More variety and they have two of my faves, Nars and MUFE. 30) Do you buy your makeup on Ebay? I never have, I'm kinda scared of fakes, lol! 33) Did you ever consider taking makeup classes? Not really, makeup is a hobby of mine, I think taking classes will make it serious. I'm not really planing on ever working as an artist. 34) Are you clumsy in putting on makeup?no. 35) Name a makeup crime that you hate? mismatched foundation, too obvious lip liners, not blending eyeshadows. 40) Do you think you look good even without any makeup on? I do, makeup is just an accessory to me. 42) What do you think of makeup? Like I said above, makeup is an accessory and hobby to me. I like experimeting with it and coming up with different combinations. I also feel so much more put together with makeup, it's the same as wearing a great pair of heels, lol! wow, that took a while! You guys' turn now! I wanted to use my Aqua eyeshadow that I bought from the Pro store earlier this month so this is what I came up with. Aqua is a gorgeous matte aqua green shade. It's a lil bit on the powdery side though so you need a good base. How's everyone's week going so far? Mine is quite slow, I kinda miss the super crazy work days when I didn't even have time to eat lunch, lol! I always have such a hard time with Copper Sparkle pigment. It's a gorgeous coppery colour but it's so friggin frosty! I usually use it as a liner but I tried it yesterday on the lid with a tone of different matte browns and it's not bad. I went for the whole bronze goddess look by loading up bronzer on my face. Here's the look. Hope you're all having a great Monday! 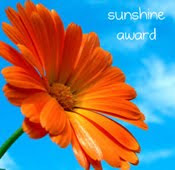 Beautiful and very talented Nepanthe from Beauty Thesis has given me a Sunshine Award! I'm so flattered to be considered as I love her blog so her opinion is important to me. Thanks girl! Please visit Beauty Thesis for inspirational FOTD's and great makeup tips. Pass the award on to 6 other bloggers. Let the nominees know they have received the award. Share the love and link to the person who gave you this award. I did this look last night for a dinner date with the hubby. It was a cold and rainy night so I went for dark and smokey all around. The only thing is that I find dark lips make me look so pale that this looks a bit like a vampire attire. I think the redish purples also bring out the gold shades in my hazel eyes, which makes the look more vampire-y, lol! What do you guys think? This is the look I wore to work today when I was having a brain freeze and didn't know what to do with my face. I've done a look similar to this before but I just wanted to wear something colourful and didn't want to think about it too much. What's everyone doing this weekend? We have our neighbours over for dinner in a couple of hours and the rest of the weekend seems free. We'll probably go to dinner/dancing tomorrow night. Hope you guys like this look. Have a great weekend everyone! I was wearing a stripey shirt and red stilettos today so I decided to compliment my outfit and came up with this look. I actually liked how it turned out, but it took me longer than usual to do my makeup which is weird for a simple look like this. I think it might be coz I had to wait for the glitter liner to dry before applying my mascara. Thursday Poll - Do you match your makeup to your clothes? I was planing on a simple and sorta nautical look for today to compliment my stripey shirt. The simpler makeup actually took me twice as long to do and I ended up being late for work. That's when I started to think how often I do makeup that matched my clothes. I don't normally like to match my makeup to my clothes. You would rarely catch me wearing purple eyeshadow with a purple shirt or red lipstick with a red dress. I'm however all for complimenting my clothes or matching my makeup to my accessories. For example, I'm wearing this stripe shirt and simple dark jeans with red stilettos and my makeup is simple cat eyes with red lips (FOTD to come this evening). So I matched my shoes and the general feel of my outfit. I also like to pick the less dominant colour in a multi-toned outfit and match my makeup to that. I find the complete matchy-matchy thing a bit overwhelming for my personal taste. How about you guys? Do you like to do a full on match or do you prefer subtle matching or simply complimenting your outfits? Or do you just grab any makeup that's near you and don't dwell on it? I made my own eyeliner with MAC Platinum pigment as part of my FOTD today. I wasn't too happy with it so I still added a thin layer of black liquid liner and finally I was satisfied. Also, can you guy believe that I only bought Woodwinked last week? I don't know why I waited so long; it's got such amazing colour payoff. Here's today's look. I skipped concealer and I included a lippie picture again. I'm in love with In Synch lip liner. I'm using it the most out of three lip liners I bought from Too Fabulous collections (I bought Naked and Trimmed in Pink as well). And you all know that I also love my Rouge Coco in Teheran. I definitely need at least two more Rouge Coco's.